I can hear some of you groaning right now. If you genuinely believe that games can become too dated to play, you’ll be rolling your eyes that I’m reviewing a text-only game that’s 25 years old. I have no defense against this, except to say that if you automatically discriminate certain games because they “look too ancient” or “probably aren’t very refined” then I think you’re missing out. If anything, I’m consistently surprised by how much these authors and game publishers really had it together from the very beginning, and Deadline is certainly a fine example if you’re willing to give it a chance. I wanted to start looking at IF releases toward the beginning to get a sense of perspective. Research informs that Deadline was Infocom’s third release, coming in after the first two Zorks, so it seemed like a good start. Marc Blank, who cut his teeth writing Zork and threatening you with grues, writes, directs, produces, edits, and caters Deadline. It’s Infocom’s first mystery story, and one of the earliest detective videogames created. Regardless of how you feel about detective yarns, it’s undeniably a perfect genre to make an interactive game out of. Every mystery novel in the world encourages its readers to be observant, think ahead, and make deductions. A game where you get to control the direction of the investigation, instead of simply tagging along watching Holmes or Dupin, just makes good sense. That’s exactly what you get with Deadline. You play as the Chief of Detectives in Edindale, Connecticut. Marshall Robner, entrepreneur and industrialist, has been found dead in his study of an apparent intentional overdose of antidepressants. No one was with him from the hours near the time of his death until the next morning, no trace of foul play was found, and the study door was bolted so tightly from the inside that axes had to be used to remove it. It seems a pretty transparent case, but the family’s lawyer asks your involvement to “quash the suspicions which are inevitable in these circumstances.” He persuades Mrs. Robner to allow you access to the house from 8am to 8 that night, on the day which he will read Mr. Robner’s will. This also ensures that the six individuals most important to Robner’s affairs will be at the house and available for questioning. I guess the only real spoiler can be inferred from the very existence of the game itself – no matter how it looks, it obviously wasn’t suicide. But knowing you’re looking for something won’t be enough. You’ll still have to discover what really happened, establish motive, collect enough evidence for a conviction, and make your arrest before the sun goes down that night. You’ll begin the game in the morning with free reign of the house. This is interesting, because it’s not a traditional linear adventure. You can stroll around at your leisure, poking through the house and examining items of interest. The six NPCs also roam around, seemingly tending to their own business. The gardner will walk around the landscape, trimming roses and getting tools from the shed. The telephone will ring, Mrs. Robner will answer it, travel to her bedroom, and ask you to leave if you’re waiting there so she can take the call. You can then listen in on another line. Touches like these not only make the characters feel alive, but the world they move through and interact with benefits from the appearance of people living in it. It’s easy to imagine you’re actually in the manor, snooping around while these people continue their daily lives and try to make sense of their recent tragedy. It’s also got the detective angle down. Following characters and looking for clues is easy. Props are included in the box and offer authentic information for your case, like interrogation transcripts, crime scene photos, and autopsy reports. Deductive reasoning is required to match the clues together, and you’ll certainly want to pay attention to the transcripts to look for inconsistencies in everyone’s stories. About the only thing that comes off as weak is the interaction with the characters themselves. You can’t question them about too many topics, as it would obviously require too much writing. Instead, you’re limited to specific, pointed questions about the case, showing them objects, or asking a generic “What’s Wrong?” You can try various combinations and get some occasionally interesting results, but generally only “Ask ___ about ____” or “Show ___ to ____” will elicit a response. Traditional parser wording troubles show up. I really like the control that text parsers can give you, compared to a relatively straightforward point-and-click system. Here, I felt like I was actually making discoveries and inferences instead of simply being led to them by finding the correct pixel. I really can’t overstate how crucial and rare that is for a detective game. However, this freedom comes at the usual cost of struggling to figure out exactly how the parser wants you to word something. The parser here is mostly average, with only occasional troubles and very few instances where you’ll have to deviate from the structured grammar rules to achieve the desired effect. If you get close in these special cases, a hint will accompany the feedback that should be enough to get you by. But every other time, if you don’t follow the strict (and somewhat boring) verb/noun patterns like “examine _____” then you won’t find the parser very forgiving. Of course, if you loathe parsers and the confusing scene-setting that their text limits them to, this title won’t convert you. It’s also easy to get the house’s layout mixed up, especially with the garden’s ordinal directions. There are blueprint-style maps online that do wonders to alleviate this, without falling into the realm of cheating. The other clues in the box, especially the crime scene photo, can also help when you arrive at those corresponding areas. Writing is fairly standard and lacking flourish. I don’t see this as a problem, as it gets right to the point in a most detective-like manner, but don’t expect a moody or stylized piece. Locations are limited exclusively to the house and its grounds, and the initial “look” summary does a respectable job of setting up the basics of each location. Most of the atmosphere will be supplied by your imagination (for whatever reason, I saw a more Southern-syle plantation house instead of a New England colonial mansion) and the gameplay will, of course, not be affected by your mental graphics. 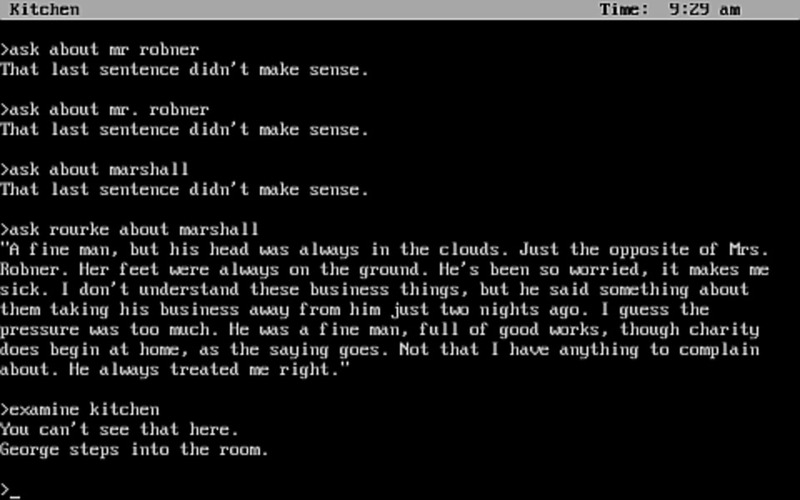 Loose items inside a room get separate sentences after the “look” paragraph, same as people or important events. Dialogue writing is a particular highlight, expertly adding to the mannerisms and emotional states of the characters. If you’re a fan of the detective genre, you owe it to yourself to at least give this a try. Text descriptions and parser gameplay by nature can be unforgiving beasts, but the freedom and sense of accomplishment they afford far outweigh any limitations. If you’ve comfortably sworn off parsers and IF long ago, that’s okay. You’re only missing out on a mostly by-the-numbers mystery that will be too underwhelming for a resistant gamer to try and force their way through. Sharp, non-linear murder mystery. You’ll have complete freedom to wander around and investigate at your own discretion. Excellent use of non-player characters. Traditionally fickle parser requirements. Directions can get confusing. Story is competent, but not overly innovative. 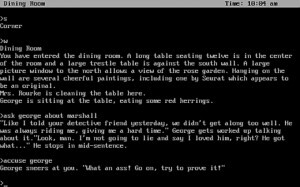 To add one thing which the game was “first” of: It is one of the earliest attempts to make an Adventure game which is not a treasure hunt. Whether it was the original Colossal Cave, Adventureland, Pirate Adventure or even Zork, they all have you stumbling around in a very basic “boy’s adventure” setting full of monsters and hidden treasure which you have to retrieve. Deadline was groundbreaking insofar that it showed that the genre could be so much more. To this day, this is still one of my favourite game. Of course, replayability is low/non-existent after solving it once. Until you get there, you can pass a lot of time with it, though, because the solution is really anything but trivial.